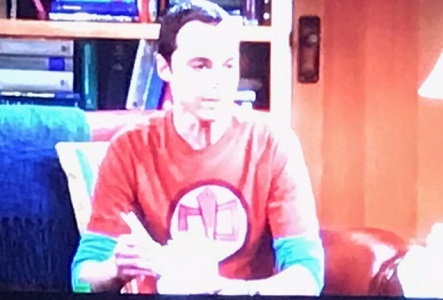 SATURDAY SUPERHEROES: SHELDON COOPER & "THE GREATEST AMERICAN HERO"
My 12 year old nephew is a big fan of 'The Big Bang Theory', which at least weans him away from the Disney/Nickelodeon teen sitcoms for the sake of everybody else's sanity who's forced to watch it with him. But the level of suggestive discourse in any given episode does make me feel a little uneasy about him watching it. 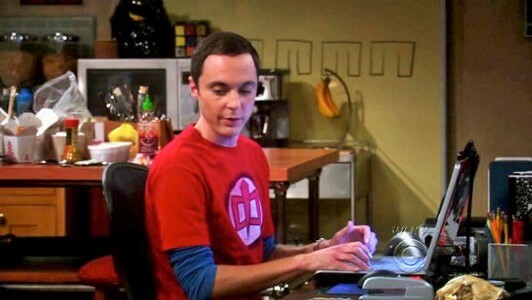 However, it's certainly better than having him watch that puerile '2 Broke Girls'. 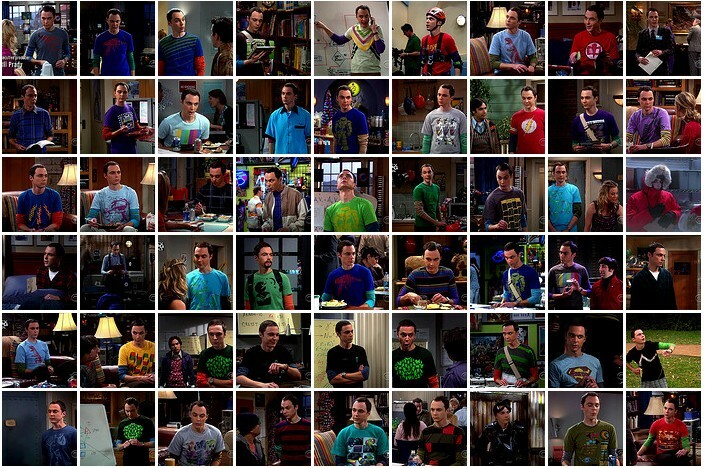 So I found a click-bait site about fifty of Sheldon's tee-shirts and slogged my through page after page until I came to Number 47. 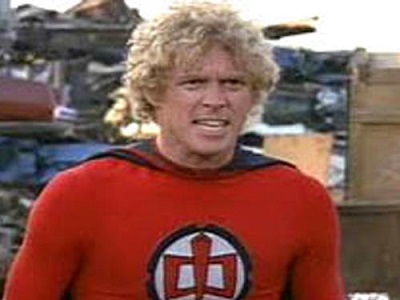 As most of Team Toobworld long since figured out, it's the emblem on "the suit" worn by Ralph Hinkley in 'The Greatest American Hero'. Most of Sheldon's tee shirts feature the emblems, logos, and artwork associated with various comic book superheroes. I think most of them might even be of the DC variety. Many of those superheroes have had televersions in the greater Toobworld Universe, but usually in alternate TV dimensions like those shows on the CW and the growing stable of series to be found on Netflix. So an off-shoot of that knowledge would be people looking to cash in for a fast buck. 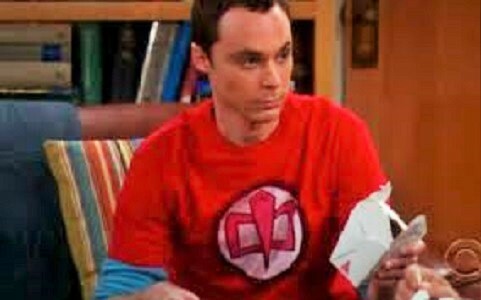 Hence, the tee-shirt market which has been enriched by nerds like Sheldon Cooper. 'The Greatest American Hero' would follow that same line of reasoning, even though it was a TV show that should be sharing the same TV dimension as 'The Big Bang Theory'. 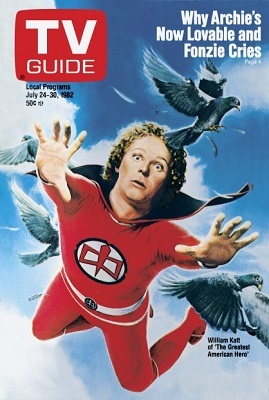 'The Greatest American Hero' is an American comedy-drama superhero television series that aired for three seasons from 1981 to 1983 on ABC. 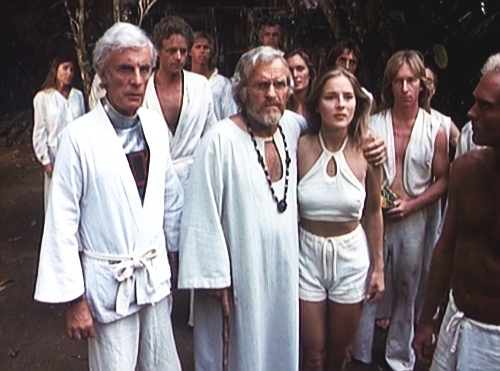 Created by producer Stephen J. Cannell, it premiered as a two-hour pilot movie on March 18, 1981. 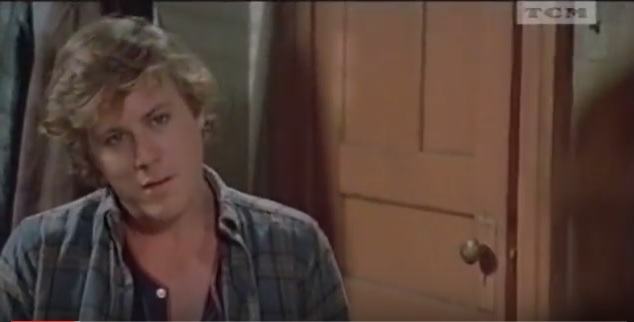 The series features William Katt as teacher Ralph Hinkley ("Hanley" for the latter part of the first season), Robert Culp as FBI agent Bill Maxwell, and Connie Sellecca as lawyer Pam Davidson. The series chronicles Ralph's adventures after a group of aliens gives him a red and black suit that grants him superhuman abilities. Unfortunately for Ralph, who hates wearing the suit, he immediately loses its instruction booklet, and thus has to learn how to use its powers by trial and error, often with comical results. During 1986, the original principal cast reunited for a pilot movie for a new NBC series to be named 'The Greatest American Heroine', which did not result in a new series, and the pilot was never broadcast by NBC. 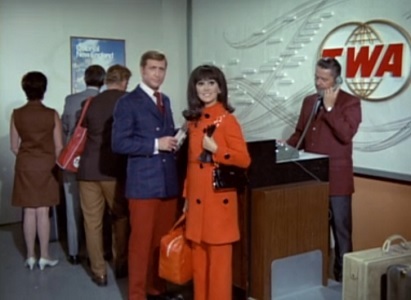 Ultimately, the pilot was re-edited as an episode of the original series (complete with original opening credits and theme), and added to syndication sets of the original series, for which it is the final episode. The pilot movie reveals that several years after the final episode, Ralph's secret identity was finally revealed to the public, resulting in his becoming a celebrity. This angers the aliens who gave him the suit, and they charge him with finding a new hero to wear the costume and use its powers for fighting evil. Once the transfer is made, they explain, all memory of Ralph's exploits will be purged from the world's memory and remembered only by Ralph, Pam, and Bill. Bill begins their search by researching people with desired hero qualities, but Ralph finds a young woman named Holly Hathaway (Mary Ellen Stuart), an elementary school teacher who spends her off-hours time looking for lost kittens, raising environmental awareness, and serving as a foster mother. 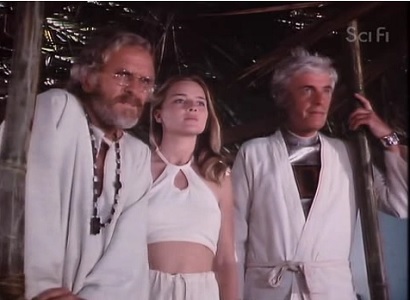 Bill, Pam, and Ralph meet in the desert, where Ralph tells Bill about Holly. He reacts visibly to his new partner being a "skirt" before Holly arrives, flying in wearing a new version of the suit made for her, and she pledges to help Bill. The original trio say their final farewells, and even the stoic Maxwell reveals his true emotions as he says goodbye to Ralph and calling Pam a trooper - "...one of the best!" Holly reacts emotionally to the fond farewells, but breaks the somber mood as she accidentally pulls the door off of Bill's sedan. The rest of the episode deals with her learning how to use the suit with Bill Maxwell's guidance, and the pair trying to develop a working relationship. It ends with Holly talking to her foster daughter about Bill, saying he is a good person; Bill, overhearing what she says about him, speaks into a recorder he uses as his "diary" to suggest that maybe she is the right person to wear the suit after all. As far as Toobworld Central is concerned, the aliens' plan for the world to undergo a collective amnesia didn't work. O'Bviously. That's why some enterprising tee-shirt company started cranking out the t-shirts. I'm not sure if my sister is planning to purchase the tee-shirt for my nephew; it is available from several online stores. But after writing up this article, I'm certain of one thing - I'm going to get one for myself! Actor John Heard, whose many roles included the father in the "Home Alone" series and a corrupt detective in "The Sopranos," has died. He was 71 . Heard was found dead Friday at a Palo Alto hotel, the Santa Clara County medical examiner's office said Saturday. An investigation, which includes a toxicology test, is underway to determine the cause of his death, but there is so far no evidence of foul play, the office said. The first time I ever saw Heard was in the movie "Between The Lines" and he vaulted into my Top Ten actors list. The funny thing is, it's mostly for his movies I like him best - This includes "Cutter's Way", "Chilly Scenes of Winter", "Cat People", "C.H.U.D. ", and even the small cameos in "The Pelican Brief" and "In The Line Of Fire". Yeah, okay, I suppose "Home Alone" as well but there wasn't enough of him in there. I'm going to miss him but I have "Between The Lines" in my DVD collection and I think "Cutter's Way" should join it. In Greek mythology, Danaë was the daughter, and only child of King Acrisius of Argos and his wife Queen Eurydice. She was the mother of the hero Perseus by Zeus. She was credited with founding the city of Ardea in Latium during the Bronze Age. Disappointed by his lack of male heirs, King Acrisius asked the oracle of Delphi if this would change. The oracle announced to him that he would never have a son, but his daughter would, and that he would be killed by his daughter's son. At the time, Danae was childless and, meaning to keep her so, King Acrisius shut her up in a bronze chamber to be constructed under the court of his palace (other versions say she was imprisoned in a tall brass tower with a single richly adorned chamber, but with no doors or windows, just a sky-light as the source of light and air). She was buried in this tomb, never to see the light again. However, Zeus, the king of the gods, desired her, and came to her in the form of golden rain which streamed in through the roof of the subterranean chamber and down into her womb. Soon after, their child Perseus was born. Unwilling to provoke the wrath of the gods or the Furies by killing his offspring and grandchild, King Acrisius cast Danaë and Perseus into the sea in a wooden chest. The sea was calmed by Poseidon and, at the request of Zeus, the pair survived. They were washed ashore on the island of Seriphos, where they were taken in by Dictys – the brother of King Polydectes – who raised Perseus to manhood. The King was charmed by Danaë, but she had no interest in him. Consequently, he agreed not to marry her only if her son would bring him the head of the Gorgon Medusa. Using Athena's shield, Hermes's winged sandals and Hades' helmet of invisibility, Perseus was able to evade Medusa's gaze and decapitate her. Later, after Perseus brought back Medusa's head and rescued Andromeda, the oracle's prophecy came true. He started for Argos, but learning of the prophecy, instead went to Larissa, where athletic games were being held. By chance, an aging Acrisius was there and Perseus accidentally struck him on the head with his javelin (or discus), fulfilling the prophecy. 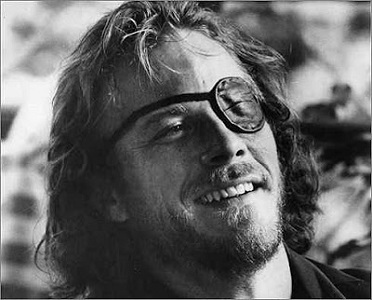 Walter Jensen is a famous anthropologist and amateur yachtsman. In 1928, Jensen and his schooner Shara are lost in the Pacific Ocean. Rudy Wells and associates search, to no avail. Jensen with his boat reaches the shield of the Zanans, during an electrical storm. Somehow the storm neutralizes the shield, and he gets through. He lands on the island, badly injured. He is found by the Zanans, who are afraid to go near him. Jensen is left for three days and nights. A Zanan lady cannot stand to hear his cries of pain any longer. She goes to him, feeds him, and takes care of him. They are in isolation for one year. Da Nay is later born to the couple, with minimal immunity against infectious diseases on Earth. First off, the date has to be a typo. Although I believe Dr. Rudy Wells is either an android or a regenerating alien - not necessarily a Gallifreyan Time Lord - I don't think he was around fifty years earlier to participate in such a search. And there was nothing about life among the Zanans which suggests that Walter Jensen would still be alive and looking no more than the 52 years of age borne by the actor who portrayed him, Robert Symonds. And then there's this: in the first episode of this two-part story, Rudy mentions that Walter Jensen disappeared in the same area as that hidden island home of the Zanans twenty years before. So we're talking 1958, not 1928. But I'm writing this blog post about the Zanan-Terran hybrid, Da-Nay, daughter of Walter Jensen and a Zanan woman. The other Zanans had appropriately alien names - Gerro the Zanan leader, plus Torg, Zandor, Arta, and Riga. And Da-Nay would seem to fit into such a pattern. But her father was a human from Earth, and I would think he would want to have a say in the choice of her name. As an anthropologist, Walter Jensen may have included Greek mythology as one of his studies. So perhaps he thought "Danaë" was a name which sounded Zanan, especially phonetically spelled out in their language - "Da-Nay" - but which evoked his own memories of the world he left behind. I don't think it had any more of a connotation than that. Just one final O'Bservation about this 'Six Million Dollar' story - the Zanans are still to be found on Earth, hidden away from human contact on their "lost island". But aside from their lack of immunity from Terran disease, there really wasn't anything which marked a distinct difference from human anatomy. It could be that since the Zanans were last seen in 1978, they have been able to build up their tolerance to human ailments, thanks to the serum. Since they had the blessings of their leader Gerro to leave the island, the Zanans could have spread out into Terran society and be unrecognizable from any human standing right next to them. And eventually as Walter Jensen did with Da-Nay's mother, they could inter-breed with humans. MISSING LINKS - "THE LOVE BOAT" AND "TWIN PEAKS"
The new incarnation of 'Twin Peaks' is loaded with cameos by actors usually known for larger roles in big screen productions or just famous in their own right for their past work - Richard Chamberlain, Candy Clark, Meg Foster are just some of the "blink and you'll miss them" who have been seen so far in the series. 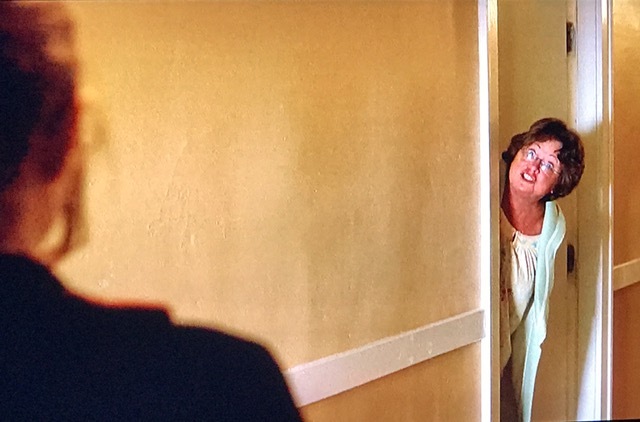 If I didn't check the credits for the latest episode, Part 11, to find Alicia Witt (whose first two roles were in Lynch productions - "Dune" and the first incarnation of 'Twin Peaks'), I might never have discovered that Lauren Tewes did a quick scene as Stephen Burnett's neighbor. Prime-Time marches on, which is why I didn't recognize her. It's been twenty years since we last saw Cruise Director Julie McCoy of the Pacific Princess and that was in an episode of the spin-off which starred Robert Urich in his last starring role. Julie McCoy is eligible for membership in the Television Crossover Hall of Fame officially. 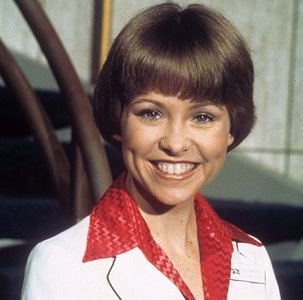 She has about 200 episodes of 'The Love Boat' to her credit, along with 'The Love Boat' spin-off appearance and guest shots on 'Charlie's Angels' and 'Martin'. So I'm thinking: what would it hurt if we added this quick cameo from 'Twin Peaks' to her tally? Like I said, it's been twenty years since we saw her last. Perhaps after a failed romance (or two) Julie McCoy decided to move to Twin Peaks, Washington. And there she's lived a quiet life, perhaps calling on her social director skills for a new career, maybe even using those skills in public service for the elderly citizens like Carl Rodd. I don't think we're going to see Ms. Tewes again as the Neighbor. (And that's how she was credited, no name listed.) So where's the harm in thinking that it was Julie McCoy living in that apartment next to 208? Trans World Airlines (TWA) was a major American airline from 1924 until 2001. It was formed as Transcontinental & Western Air to operate a route from New York City to Los Angeles via St. Louis, Kansas City, and other stops, with Ford Trimotors. With American, United, and Eastern, it was one of the "Big Four" domestic airlines in the United States formed by the Spoils Conference of 1930. TWA was headquartered at one time in Kansas City, Missouri, and planned to make Kansas City International Airport its main domestic and international hub, but abandoned this plan in the 1970s. The airline later developed its largest hub at Lambert-St. Louis International Airport. Its main trans-Atlantic hub was the TWA Flight Center at John F. Kennedy International Airport in New York City, an architectural icon designed by Eero Saarinen and completed in 1962. For the full Wikipedia entry, click here. But while they were in operation, TWA used its influence to shore up their presence in Toobworld. 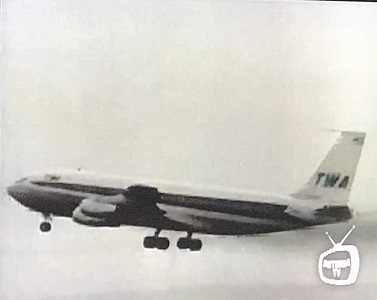 I think you would see TWA airliners more often than any other airline's planes whenever TV characters had to fly. Of course, nowadays it's more fun to use fictional airlines, especially if there's going to be trouble in the air. I'm not sure if it hadn't been for 'Lost', Oceanic Airways might never have achieved membership in the Television Crossover Hall of Fame. 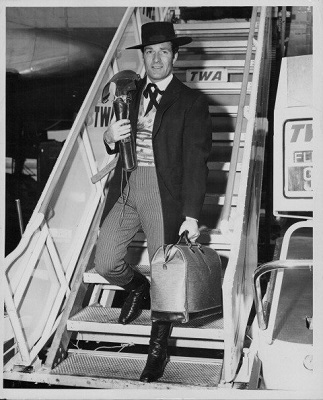 Just in case you were wondering how deeply I get into my Toobworld fantasy world, I do NOT believe that there's a picture of Wyatt Earp getting off a TWA plane seen above. Even I know that it's a picture of Hugh O'Brian in costume. Abraham, originally Avram or Abram, is the common patriarch of the three Abrahamic religions. In Judaism he is the founding father of the Covenant, the special relationship between the Jewish people and God; in Christianity, he is the prototype of all believers, Jewish or Gentile; and in Islam he is seen as a link in the chain of prophets that begins with Adam and culminates in Muhammad. The narrative in Genesis revolves around the themes of posterity and land. 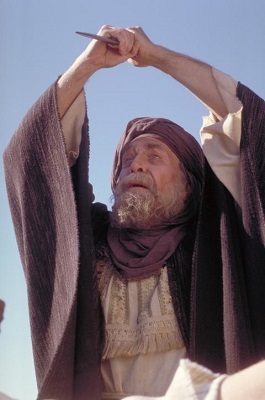 Abraham is called by God to leave the house of his father Terah and settle in the land originally given to Canaan, but which God now promises to Abraham and his progeny. Various candidates are put forward who might inherit the land after Abraham, but all are dismissed except for Isaac, his son by his half-sister Sarah. Abraham purchases a tomb (the Cave of the Patriarchs) at Hebron to be Sarah's grave, thus establishing his right to the land, and in the second generation his heir Isaac is married to a woman from his own kin, thus ruling the Canaanites out of any inheritance. 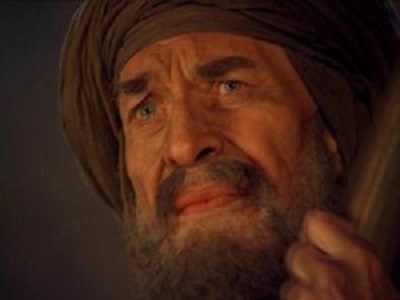 Abraham later marries Keturah and has six more sons, but on his death, when he is buried beside Sarah, it is Isaac who receives "all Abraham's goods", while the other sons receive only "gifts" (Genesis 25:5–8). The story of Abraham took place in many TV dimensions, includiing Skitlandia and the Tooniverse. And there were other heavy hitters besides Martin Landau to have played the role - Richard Harris and Gene Barry. "All faith must have a little doubt mixed in. Otherwise it's just flabby sentimentality."